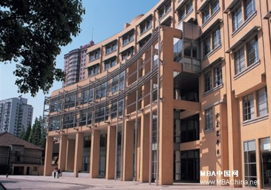 Shanghai Jiao Tong University has one of the oldest business schools in Chinese history. In 1996, the American Aetna International Corporation financed and collaborated with Shanghai Jiao Tong University to build the College of Management. The college has been accredited internationally by the AMBA (Association of MBAs) and EQUIS (European Quality Improvement System); and was ranked 37th in the Financial Times Masters in Management ranking in 2009, taking the lead in Asia. The university has established long-term collaborations with 67 reputable universities overseas such as Harvard University, Yale University, MIT Sloan School of Management, The Wharton School of the University of Pennsylvania, University of British Columbia, The Business School of the University of Texas at Austin, and Euromed Marseille School of Management; as well as supporting exchange programs for students and professors annually.